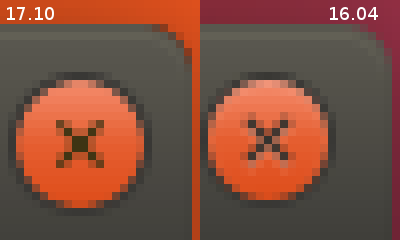 Window buttons and window edges are not rendered/designed cleanly - Ubuntu 17.10 Gnome. This is really just a cosmetic issue. The window edges (mostly only top left) and window buttons were sharper and clearer in Ubuntu 16.04 und the versions before. The rough window egdges do not appear in all windows, it is especially obvious with Firfox. The impression with the buttons is always present. This is apparent in stock Ubuntu 17.10 on various laptops (Thinkpad x220, Acer Aspire 5253, Macbook Pro late 2010). 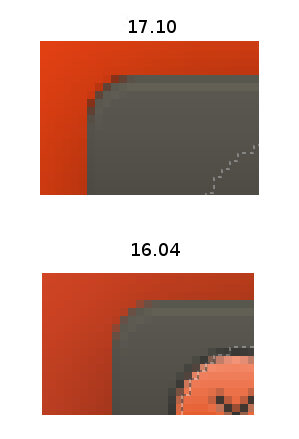 I'm looking at both 16.04 and 17.10 on identical monitors and can't see the problem you're talking about. Thanks for your quick reply. No, its on the Laptop screen with the correct driver for each laptop in place. Maybe I'm a little too sensitive for these cosmetic issues, the difference strikes me immediately. Maybe its just because the buttons are scaled a little bigger in 17.10. I see grey pixels inside the red close button. It looks cleaner in 16.04. Screenshots attached. And the Screenshot for 16.04. I have put your two screenshots side by side, flipped, and zoomed in. See attached. It appears there is no difference in the window decoration edges (although the different wallpaper colour behind makes them look different). There is definitely a change in the X button design that is now visible. In the attached screenshot one can see that there is a difference in the color of the outer pixels of the screen edge. In 17.10 there is a darker grey. Both windows were in the front, when the screenshots were taken. To me, due to the less smooth transition of colors, the screen edges in 17.10 look somewhat rough, ripped. The above mentioned darker window edges in 17.10 do not appear in all windows. They appear in Firefox, Thunderbird and e.g. the Gnome Terminal (maybe this has to do with gnome-terminal being at 2.24). The window decorations in for example the file-manager are not affected. I see, thanks. Yes it sounds like legacy X apps are the ones affected. Native Wayland apps (Gnome 3.x) are not affected.